Hundreds of companies from around the world have pledged to purge forest-killing activities from their supply chains, and most aim to deliver by embracing certification programs. At Wednesday’s ISEAL Conference in DC, panelists will take stock of what works, what doesn’t, and why. 5 May 2016 | Companies across the globe are instituting commitments and implementing plans for how to remove deforestation from the production of commodities – principally, palm, soy, timber & pulp and cattle. Supply-change.org, a project of Forest Trends, has currently identified and publicly profiled a total of 366 such companies – more than one for each day of the year – who are acting to manage business risks, mitigate impacts of climate change, and generally make their businesses more sustainable, while ultimately appeasing stakeholder concerns. Embedded within these zero deforestation commitments is a wide array of goals and policies – from participation in existing certification programs and meeting legal requirements, to going above and beyond the competition by initiating specific activities that reduce consumption, avoid the burning of forests, and promote traceability and transparency. On top of this, more and more companies are embracing the principle of free, prior and informed consent (FPIC) when engaging with indigenous and traditional communities – embedding social outcomes into their pledges. Among the policy elements included in these commitments, certification tends to be at the top of the list. Certification standards offer a turnkey option for sustainability. While many companies go beyond certification alone, certification schemes appear to serve as an important baseline for commitments. At least 77% of commitments tracked by Supply Change projects rely fully or partially on third-party commodity certifications to identify commitment-compliant commodity supply. 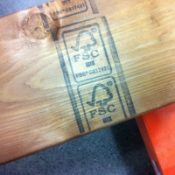 Commodity certifications include those administered by multi-stakeholder roundtables such as the Forest Stewardship Council (FSC) and the Programme for the Endorsement of Forest Certifications (PEFC) for timber and pulp, the Roundtable for Sustainable Palm Oil (RSPO) for palm oil, the Round Table for Responsible Soy (RTRS) for soy, and the Leather Working Group (LWG) for leather. On a commodity-by-commodity level, roughly 21% of global palm oil production is certified under the RSPO. Mondelez International, one of the panelists in our breakout session next Wednesday, May 11, at the ISEAL Global Sustainability Standards Conference in Washington, D.C, cites certification as a component of their zero deforestation commitment. Meanwhile, 10 to 15% of managed forest area is certified under the FSC or PEFC and 10% of global leather production is certified under the LWG, while less than 1% of global soy production is certified under RTRS. What are the limitations of certification? Do certified commodities achieve a price premium? How can certification help companies manage risk, mitigate the impacts of climate change, and other critical sustainability issues? Does certification appease stakeholder concerns? How significant are the commitments to certification and how much progress are the companies making in fulfilling their commitments? Which other goals and policies are relevant for companies to achieve their deforestation commitment? Supply Change data will help inform next Wednesday’s breakout session. Register here; friends of Forest Trends will receive a 10% discount when applying the promotional code “FOREST10”. In addition, Supply Change will be launching its second Annual Report in June. Sign up for the newsletter here to be included on report launch invitations and press release announcements. Supply Change will be providing coverage from the ISEAL conference and cross-posting on Forest Trends’ Ecosystem Marketplace. Stephen Donofrio is a Senior Advisor for Ecosystem Marketplace.